MoonMarble.com - Cathy Richardson - "Coral Reef Marble"
Art Glass → Contemporary Handmade Marbles → Cathy Richardson - "Coral Reef Marble"
Handmade contemporary art glass marble by artist Cathy Richardson of Touchstone Glass. 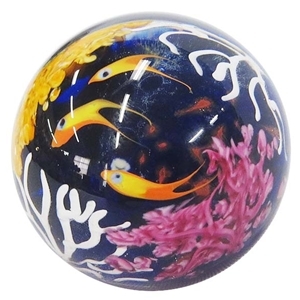 This marble features a coral reef scene trapped in the center of a clear marble with three orange and yellow fish hovering just above the sea floor. This marble has so much color and depth. This marble is 2" in diameter marble. Signed and dated.